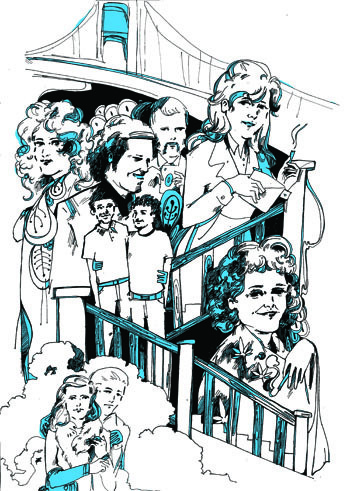 In the heart of San Francisco, American Conservatory Theater gives us “Tales of the City”, a new musical based on Armistead Maupin’s newspaper-column-turned-novel-series of San Francisco’s stories and personalities. Directed by Jason Moore, “Tales of the City” is a musical that is part funny, part touching, part raunchy and part weird — and although it fits perfectly here in San Francisco with its Bay Area in-jokes and fierce local pride, it’s hard to imagine it translating well to another city. Mary Ann finds a new home at 28 Barbary Lane, as well as a family of characters whose struggles spawn the other tales of “Tales.” The adorable Michael “Mouse” (Wesley Taylor) is unlucky in love — and in hiding his homosexuality from his parents — and Mona (Mary Birdsong…please let that be a stage name) struggles with drugs and family. Tying them all together is the 28 Barbaray Lane landlady Anna Magrigal, played by Tony Award-Winner Judy Kaye. Kaye is the sort of Broadway diva who merits applause just by appearing on stage for the first time. But boy, does she appear on stage for the first time like a pro — not to mention her spectacular voice. The music by Jake Shears (of Scissor Sisters) and John Garden sometimes feels like “Rent,” sometimes like “Hair,” and a lot of the time like disco. Some of the most crowd-pleasing numbers fall in the latter category, with disco moves choreographed by Larry Keigwin worth remembering for your next 70’s theme party. Other favorites were big chorus numbers steeped in epic harmonies and, of course, any time Kaye opened her mouth. Though the songs are catchy and fun, the show’s incessant marijuana jokes get a little tired after the first few scenes. There should be a quota for winks to weed per San Francisco-themed play or musical. We get it. It’s 1976 and you’re in San Francisco and you’re smoking a joint, and the ex-hippies present in the audience’s are omitting a collective chuckle of nostalgia. “Tales” deals with some tough issues but remains lighthearted. Until, that is, a bizarre plot twist toward the end, when all of a sudden — without giving away the action — things get a little perverted. Librettist Jeff Whitty might rethink this plot move if this musical makes it out of San Francisco. It adds more discomfort than shock value. Despite this one moment of weirdness and the occasional cornball joke, this musical manages to achieve what any musical must: to entertain, to warm hearts, and to plant a desire for flamboyant dancing. For us at least, who can titter self-consciously at Mary Ann’s mispronunciations of San Franciscan street names — how Cleveland of her! — this musical is certainly a charmer to ring in the summer in San Francisco.